As a key figure of the 1960s Lower East Side arts scene, Aldo Tambellini used a variety of media for social and political communication. In the age of McLuhan and Fuller, Tambellini manipulated new technology in an exploration of the “psychological re-orientation of man in the space age.” He presented immersive, multi-media environments and, having made his first experimental video as early as 1966, participated in early collaborations between artists and broadcast television. Aldo Tambellini will be present to introduce and discuss his early work in film and video. Programme curated by Mark Webber for Evolution 2007. Programme repeated at Lucca Film Festival 30 September 2007. The Black Film Series, a sequence of seven films made between 1965-69, is a primitive, sensory exploration of the medium, which ranges from total abstraction to the assassination of Bobby Kennedy, the Vietnam War, and black teenagers in Coney Island. Before picking up a camera, Tambellini physically worked on the film strip, treating the emulsion with chemicals, paint, ink and stencils, slicing and scraping the celluloid, and dynamically intercutting material from industrial films, newsreels and broadcast television. Abrasive, provocative and turbulent, the series is a rapid-fire response to the beginning of the information age and a world in flux. In 1966, Tambellini purchased the first Sony video recorder and made an experimental tape by shining a light directly into the camera lens, burning out the photoconductive vidicon tube. This monochrome tape was broadcast by ABC Television in 1967. Black Video Two – spontaneously improvised from test signals whilst the first tape was being duplicated – was later colourized using the Paik-Abe Video Synthesizer at WNET (1973) to create 6673. 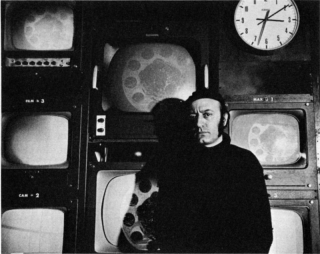 One of the first artists to explore television as a means of personal expression, Tambellini collaborated with Otto Piene on Black Gate Cologne, an hour-long multi-media happening broadcast by WDR in January 1969, and contributed to The Medium is the Medium at WGBH Boston, alongside Nam June Paik and Allan Kaprow (also 1969). That same year, under commission from the Howard Wise Gallery, Tambellini worked with Bell Laboratories engineers to create Black Spiral, a manipulated television set, for the groundbreaking exhibition “TV as a Creative Medium”. During his tenure at the Center for Advanced Visual Studies at the Massachusetts Institute of Technology in the 1970s and 1980s, Tambellini established Communicationsphere, connecting artists with technicians and engineers to “dissolve the boundaries between media, the arts and life.” Most recently he has returned to writing and performing poetry, and made the award-winning digital video poem Listen (2005) in collaboration with Anthony Tenczar. Reaching beyond its application as an aesthetic tool, Tambellini has consistently used media as a means of social and political communication, often working in collaboration with others to investigate the creative potential of electronics and technology. This interview with Aldo Tambellini was shot on 21st December 1967, at the Black Gate Theatre, for an ABC Television series on the New York Lower East Side Arts Scene. It includes an excerpt from Black Video One, his first experimental videotape, which had been made the previous year by shining a light directly into the camera lens, burning out the photoconductive vidicon tube. 6673 is based on Tambellini’s second tape, Black Video 2, which dates from 1966. It was created at the Video Flight dubbing house by manipulating test patterns and other electronic signals. The soundtrack combines audio produced by an oscilloscope (which also distorted the images) with Tambellini’s wordless, vocal improvisation. In 1973, Tambellini added colour and further manipulated the original material using the Paik-Abe Synthesiser at WNET’s artists’ television lab in New York.